Nia Griffith MP, Labour’s Shadow Wales Minister reflects on the impact of government policies on women in Wales. This weekend we mark two important days in the calendar for women. The first is March 8th which is international women’s day, a day traditionally linked to celebrating women’s achievements, and inspiring women to continue the struggle to roll back prejudice and campaign for equal rights. It dates back to 1909, a time when women were fighting for the right to vote and hold public office, as well as starting out on the long struggle for greater equality in the workplace. Then on Sunday we will also be celebrating Mother’s day, when families try to show some appreciation of the tireless dedication and hard work that mums do, all year round, to make sure everyone else in the family is sorted. 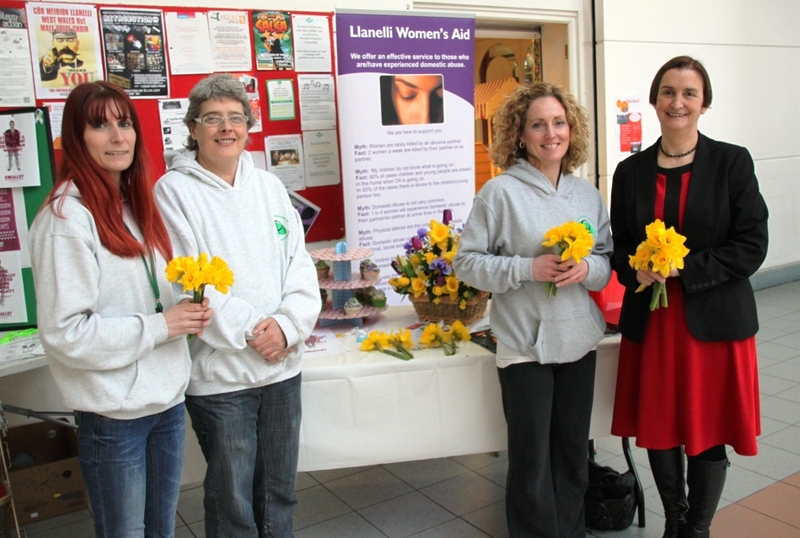 But women in Wales have little to celebrate at the moment, particularly those on lower incomes. Over the years, women have won better maternity rights, and better recognition that a family needs support at the birth of a child, a time of great joy, but also very often a time of considerable strain on the family finances. But David Cameron and his Tory government are turning the clock back, and taking away support from families just at a time when they need it most, so the 35,000 women who are having a baby this year in Wales will find themselves amongst the worst hit by cuts, which will hit the poorest hardest. So, for example, according to figures compiled by the House of Commons Library, a family with a new baby with a joint income of £24,000 will be losing £1,300 worth of support for mums and their babies during pregnancy and the first year after a baby’s birth. This is happening because of the scrapping of the health in pregnancy grant, child trust fund and the baby addition to tax credits, together with real -term cuts to statutory maternity pay, sure start maternity grant and the child care element of tax credits. As if that was not enough, at the same time, they, like other families, will see a freeze in their child benefit amounting to a real terms loss of about £400. As for families whose low income means that they qualify for housing benefit, from 1st April this year, a couple with two children under 10 who have been an allocated a three –bedroomed council house (because most social housing in Wales is three-bedroomed) will from April 1st be paying the bedroom tax – that means that whereas up until now, their rent was paid, cuts mean there will be a shortfall that they will have to make up from other income. And they will have little prospect of finding a two-bedroomed property as they compete with 46% of all social housing tenants of working age in Wales, namely some 40,000 families, who will also be chasing the few smaller properties. The cuts to maternity pay could see some women struggling to go back to work earlier, if they can sort out childcare arrangements. That is of course always supposing that they still have jobs to go to. As the cuts in the public sector really begin to kick in, the impact will be particularly great on women. 64% of public sector employees are women, so just on crude numbers, more women than men are likely to be affected by the cuts in the public sector, but when you think that men still hold a disproportionately high number of the top posts, and in many sectors cuts seem to fall disproportionately on the junior ranks, where women are over-represented, the impact on women is even greater. Of course, some posts will be eliminated by early retirement, but already we are beginning to see the effects of a freeze on recruitment, with numbers of young women in Wales who are unemployed rising rapidly. Many of the traditional routes into work for women in the public sector are simply not recruiting. But it is not only the public sector; yet again this week, a familiar town centre firm Thomas Cook has announced widespread closures, and you only have to look up and down the local high street and see the boarded up shops to be reminded of the impact of the government’s economic policies on the retail sector, another area which has traditionally employed high numbers of women. All this is having an absolutely devastating impact on opportunities for young women in Wales with a massive 19% increase in the past year in the number of women under 24 who are out of work, some 3,000 more than last year. With women paying for three quarters of government changes to tax and benefit systems, it is hardly coincidental that out of the eight Conservative MPs in Wales, not one is a woman, and Cameron has only four women in his cabinet. No wonder women have been the first to see through his pathetic pretence at modernisation of the Tory party – and seen it is nothing but a sham from a Prime Minister who robs pregnant women and their babies to give a tax cut to millionaires.